The following is a brief sketch of Col. Lawrence M. Allen’s campaigns in the mountains of East Tennessee and Western North Carolina while on detached service under military orders. Only a few of the notable battles in which he was engaged are mentioned in this narrative, as such battles are recorded in the regimental history. AS PER ROSTER AT RALEIGH, N.C.
COL. LAWRENCE M. ALLEN, the subject of this narrative, who became so conspicuous in the late Civil War as Colonel of the 64th N.C. Volunteers, was born in Buncombe County, N.C., on the 15th of October, 1833. His father, Riley Allen, was a substantial farmer, a kind father, and controlled well his household. Col. Allen's mother was a Miss Reese, from Spartanburg, S.C., before she married Riley Allen, and on both sides of the house their ancestors were of Revolutionary extract. Lawrence M. Allen was an energetic boy, always at the head of his class at school, strictly obedient, never giving his teachers trouble, and never known to have any difficulty with his schoolmates or associates. He obtained a fair English education. 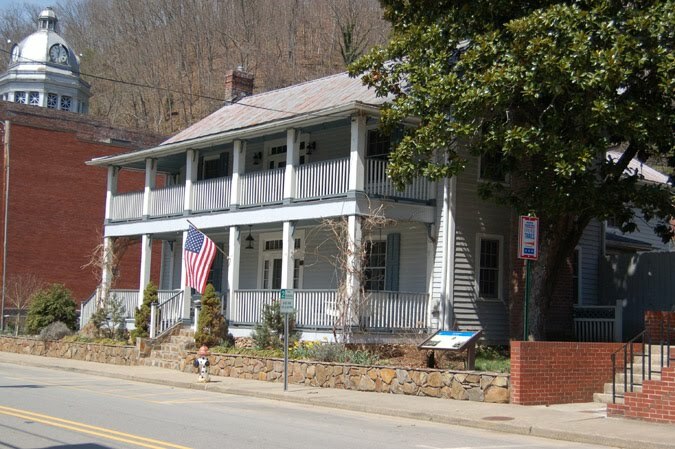 In 1853 he married a Miss Mary M. Peek, of excellent standing, and settled on a farm, and by industry, enterprise and integrity, acquired valuable property in Marshall, N.C.
About this time a portion of Buncombe County, with a strip of Yancey, was cut off to form Madison County. Soon after this county was organized, L.M. Allen was elected Clerk of the Superior Court of Madison County. He so well discharged the duty of his office that in his second race his opponent, though in good standing, received only fifty votes in the whole county. L.M. Allen was one of the leading Democrats of his county and always a delegate to the State Democratic Convention. While Clerk of the Court, President Lincoln issued his proclamation calling for troops to coerce South Carolina, as she had fired upon and captured Fort Sumter. This proclamation created such a profound sensation that the militia were called out. On the Saturday following, a company of volunteers, one hundred strong, were organized, and John Peek, a Mexican veteran, was made captain of the first company from Madison County. At the first call Lawrence Allen volunteered, and installing a deputy clerk in his office, he moved out with the company to Raleigh on the first of May, 1861. The company went into camp of instruction, and shortly afterward, the 16th regiment, then called the 6th, was organized, and Captain Peek's Company was lettered Company B in the regiment. Stephen D. Lee, of Asheville, was elected Colonel. About the time of the battle of Big Bethel, the Regiment received marching orders to go to West Virginia, at Valley Mountain, and was placed in Loring’s Brigade, Gen. R.E. Lee Commanding the Department. About the first of July, 1861, another company of one hundred and twenty-five men was organized in Madison County, and by a unanimous vote elected L.M. Allen their Captain, who received orders from the War Department to take charge of his company and move without delay to Richmond, Va., which order was promptly obeyed. The company was placed with the 2d N.C. Battalion, Col. Wharton J. Green commanding, which did duty in and around Richmond until December following. The battalion was then ordered to Wilmington, N.C., as it was not known where the Federal fleet, commanded by Gen. Burnside, would make an attack along the coast. They camped at Mitchell’s Sound and drilled regularly until the 30th of January, 1862, when the battalion was ordered to proceed in haste to Roanoke Island. The command hastened to Norfolk, Va., and was tugged, in barges on the Chesapeake Bay, to Roanoke. An engagement was going on when it arrived, and landing amid the shells and shots of the enemy, the battalion formed and double-quicked three miles to headquarters where it received orders. Col. Green did well his duty -- a brave officer and a true gentleman. Capt. Allen, of Company A, did credit to himself and his command. The preparations for defence on the Island were poor and General Wise being sick, had gone to Nag’s Head, and the command fell on Col. Shaw, of the 8th N.C. Volunteers, who did all in his power to protect the Island, but the enemy was too formidable for the small force; so on the 8th of February, 1862, Col. Shaw surrendered the Island to the Federal forces, commanded by Gen. Burnside. The third day afterward the Confederate officers were marched under guard on to the steamer Spaulding, the field and staff getting cabin fare. All company officers were placed in the hull of the vessel and well guarded. Within a few weeks they moved all the Confederate prisoners from the Island and landed them at Elizabeth City, where they were all paroled, most of the 2d N.C. Battalion going up the Dismal Swamp Canal to Norfolk, Virginia. Elizabeth City had been evacuated, and the soldiers suffered greatly for food. After a march of a couple of days they got on tug boats and finally reached Norfolk. Captain Allen and his company went by the Petersburg route to Lynchburg, then took the East Tennessee and Virginia Railroad to Greenville, East Tennessee, the nearest point by rail to their homes in Madison County, N.C. There were many slides in the road, which rendered their progress slow, but through Virginia they were provided with rations. Arriving at Greenville at 11 o’clock at night, Captain Allen fed all his men, ninety-one in number, at a hotel, and moved out on foot at 9 A.M. The next day all reached their homes. 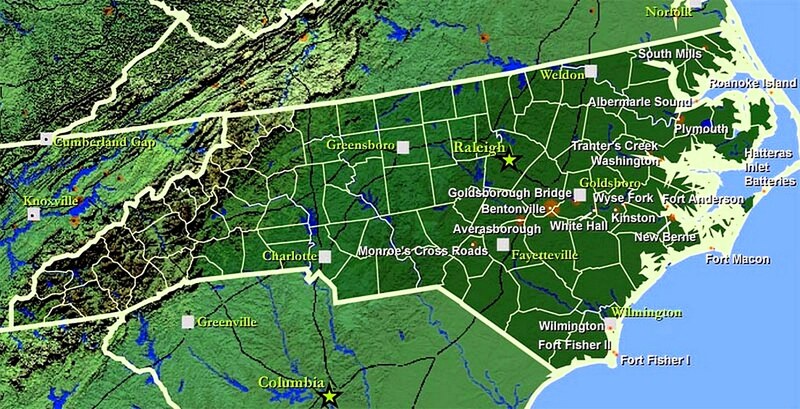 Soon after his arrival home Captain Allen received a summons to appear at Richmond, Virginia, before a Senate Committee to give evidence relative to the battle and fall of Roanoke Island. Hon. B.S. Gaither, of North Carolina, was chairman of the committee. After the investigation Captain Allen visited many of the North Carolina Regiments, then in front of Richmond, and after having an interview with the Secretary of War, returned to his home at Marshall, N.C. After a little rest he used his influence in helping to organize troops. The first was a cavalry company, one hundred strong. Captain Allen mounted and equipped the company out of his own funds, so by the 20th of July, 1862, he had 1,700 troops ready for action. By this time he was exchanged, commissioned Colonel, and received marching orders. Allen’s Legion, for that it had been named, was ordered to Greenville, East Tennessee, and drill officers assigned him, but in three weeks he was ordered with his command to Knoxville to report to General E. Kirby Smith, commanding the Department of East Tennessee, and was at once assigned to duty. Colonel Allen took great pride in military tactics and soon had his men well drilled. He was kind and good to his men, but his orders had to be obeyed. East Tennessee was so disaffected they had much hard service, sending out scouting parties far and near. On the 30th of August, 1862, Colonel Allen was ordered to take four of his companies and scour the mountains of Severe and Blount counties. They crossed Holston river at Knoxville after dark, traveled all night; the next evening run on a body of men in the mountains, captured them, and found among them two who had recruiting papers for the Federal service. Colonel Allen sent them under guard to Knoxville and continued his search, capturing quite a number before his return, among them several recruiting officers. Colonel Allen, on his return to Knoxville, was ordered with his legion into Kentucky, where he had several skirmishes with the Federal scouts. He joined the main army just in time to be in the battle at Perryville, Kentucky, where, at the head of his column, he made a charge on the enemy’s left wing, he being on the Confederate right. The Federals soon retreated, leaving him master of their former position. When the Confederate army fell back into East Tennessee, Colonel Allen returned to Knoxville with several hundred government mules, which had been captured while in Kentucky. He turned them over to the Chief Quartermaster, who sold them soon after at a government sale. From 22d of October, 1862, until January 1, Colonel Allen commanded the post at Knoxville, Tennessee. About 15th December, 1862, his legion was disbanded, his battalion of cavalry being assigned to that of the gallant Colonel G.N. Folk, of North Carolina, making a full regiment. Colonel Allen commanded the Infantry, which was constituted the 64th North Carolina Regiment Volunteers. Early in January, 1863, Colonel Allen was ordered with his regiment to Bristol to report to General Humphrey Marshall. Bristol is in both East Tennessee and Virginia. Being on the line the enemy was raiding in from Kentucky, trying to destroy the salt works in southwest Virginia, which was so important to the South for her supply of salt. The Colonel arrived in due time; the enemy was approaching in force, but were met and repulsed with considerable loss. The coast being clear Colonel Allen returned to Knoxville, marching through several counties in East Tennessee, capturing and breaking up several lawless bands....continue to 64th North Carolina Infantry Regiment: A Regimental History, by Captain B. T. Morris, Sixty-fourth North Carolina Regiment. Source: Walter Clark, North Carolina Regiments 1861-65, Volume III.